Scary-Crayon: Dusty Plastic HELL: The Halloween Special!!! 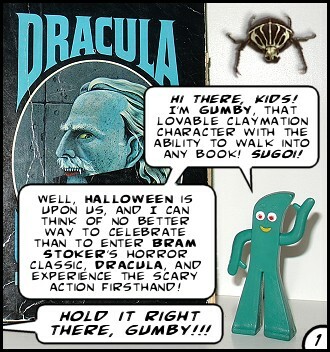 Created by animator Art Clokey in the 1950s, Gumby was a shapeshifting boy made of green clay who had the amazing ability to not only enter books, but could somehow inexplicably alter the events that took place therein. 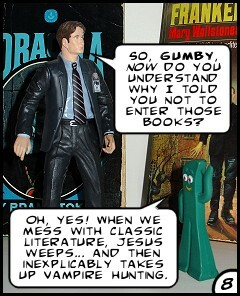 Gumby's adventures were previously explored on Scary-Crayon in last year's four part Christmas with Gumby review (click here to open the first part in a new window). Halloween is celebrated on October 31 and is associated with dressing up in costumes, begging for candy, and all manner of spooky and demonic phenomena. As with most of the other topics mentioned in these notes, visit Wikipedia for more information (in many cases, we've provided the links for you). Dracula, the titular character in Bram Stoker's 1897 novel, is the most popular vampire of all time -- even though relatively few people have actually read the book in which he debuted (myself included; I'm not scolding anyone here!) -- with the character having appeared in a vast number of films both based on and almost completely unrelated to Stoker's original work. Parties interested in becoming better acquainted with that Dracula are invited to read the online text of the novel. Fox Mulder and Dana Scully, respectively played by David Duchovny and Gillian Anderson, were the principal characters in the television show "X-Files", on which the two FBI agents routinely investigated various paranormal happenings. Scully was the resident skeptic of the duo, stubbornly refusing to believe in any form of paranormal phenomena whatsoever -- even when she was abducted and possibly impregnated by aliens! 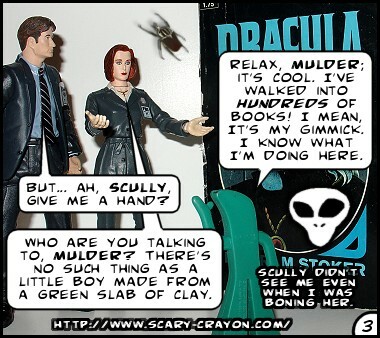 Hence the Grey alien that appears in the third panel. 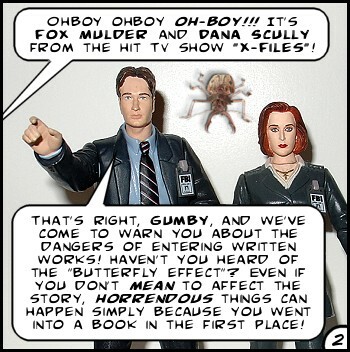 In the second panel, Mulder uses "butterfly effect" to communicate the notion that small changes can have dire and far-reaching consequences, though the phrase technically refers to a postulate in chaos theory that encompasses a similar concept. This idea was also explored in a 2004 film starring Ashton Kutcher, more/less appropriately titled The Butterfly Effect (which manages to be an entertaining and even thought-provoking film despite Kutcher's atrocious acting and some unintentionally laughable story developments), and has been a common theme of science fiction stories involving time travel (cf. Ray Bradbury's A Sound of Thunder) and the study of environments largely undisturbed by man. Yes, Virginia, even Batman danced with Dracula. 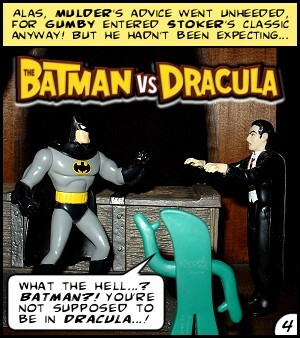 Their initial meeting apparently took place in Batman & Dracula: Red Rain, the first of a graphic novel trilogy that saw Batman pitted against (and eventually turned into one of) the bloodsucking fiends, but the Dark Knight and the Dark Lord of the Vampires recently slugged it out in The Batman vs. Dracula: The Animated Movie as well. 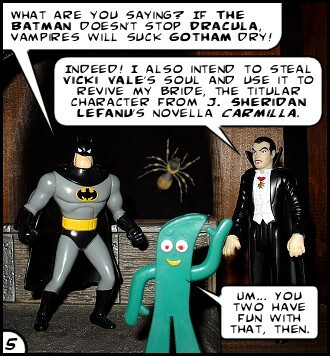 As noted in the comic above, in addition to staking a claim on Gotham City, Dracula attempted to steal the soul of Vicki Vale in order to resurrect Carmilla, the titular character of Joseph Sheridan LeFanu's 1872 vampire novella. The complete text of that novella can be read online here. Like Stoker's Dracula, Mary Wollstonecraft Shelley's 1818 novel Frankenstein (click here to view the complete online text) introduced a monster that would be immortalized in cinema and other adapted media that often bear little resemblance to the original work (cf. Frankenberry). The seventh panel above is a reference to the 1843 film Frankenstein Meets the Wolf Man. Among the various creepy crawlies that appear in places throughout the comic, you might have noticed Brundlefly, the fly with the head of Jeff Goldblum, in the sixth panel. This is a reference to his character in David Cronenberg's 1986 film The Fly, a remake of the 1958 movie of the same name. The eighth panel includes a spoken reference to Jesus Christ Vampire Hunter, another example of a character from a well-known book appearing in media that has little to do with the original work. Starlight and Red Butler are characters from "Rainbow Brite", a classic 1980s children's cartoon featuring a group of childlike deities (or maybe they were aliens; their heads were way too big for them to be human and they hung out with human characters whose heads were nowhere near that large) with magical powers and a sworn duty to protect colors from a villain whose aim was to greyscale the world. 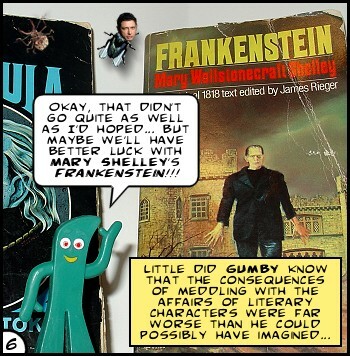 Gumby's comment in the last panel also refers to a July 2005 incident in which a Seattle man was fucked to death by a horse (click here for details on MSNBC, but you'll have to find the video for yourself) and the propensity of fanfic authors to offend all known standards of decency in their stories. Dusty Plastic HELL is an action figure comic series on Scary-Crayon, an eldritch humor website, and typically depicts various toys from unrelated works embarking on some quest or another with some particular goal in mind (cf. Twisted Toyfare Theater in Toyfare Magazine and Twisted Kaiju Theater, a webcomic featuring Godzilla action figures). Though official Dusty Plastic HELL episodes are few and far between -- the story introduced in July 2004's issue still remains unresolved -- lite versions of the comic, entitled "Hot Flashes", are posted on a regular basis. In addition to utilizing toys and even pets, the Hot Flashes are also hand-drawn or created from video game and TV/film screen captures.